For the next stage of my tour of the electoral map, I’ve split the giant Yorkshire and Humber region in two more manageable chunks. And before we go any further, yes: I know Humberside no longer exists. Its former borders are still used by the Boundary Commission to divide up constituencies, however. It is these seats, plus those in Lincolnshire, that I’m dealing with here; I’ll tackle the rest of Yorkshire later. There’s a sharp polarisation across the region. 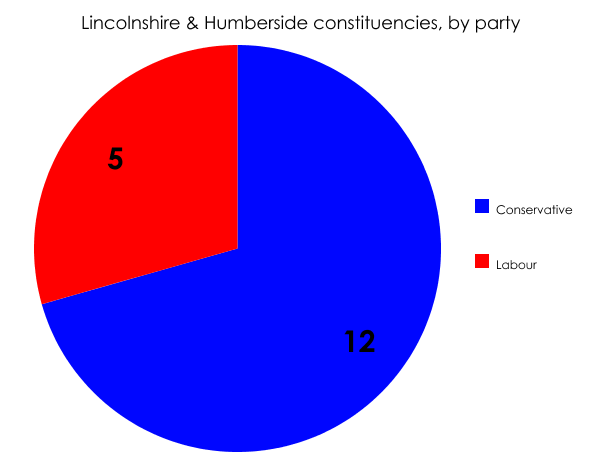 The Tories hold every single one of the seven Lincolnshire seats. Labour holds all of the seats in Hull, along with the other coastal towns and ports. As such – and like East Anglia – I doubt there will be many constituencies changing hands at the election. 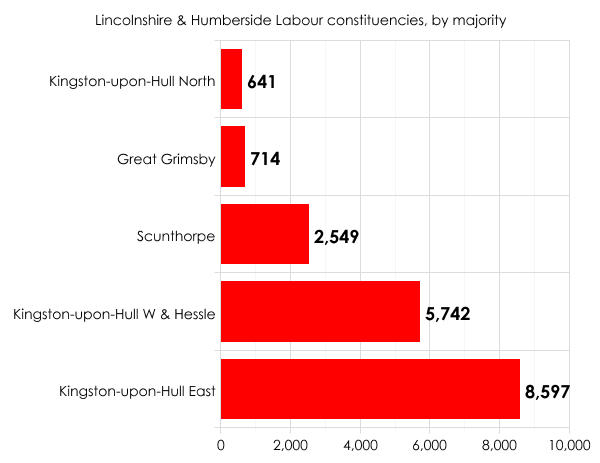 In return, the party is eyeing two possible gains from Labour: Great Grimsby and Scunthorpe. With Austin Mitchell stepping down, Great Grimsby would ordinarily be ripe for the taking. But these are not ordinary times, and Ukip is planning to mount an aggressive campaign in the seat, believing it can win. An opinion poll in 2013 showed the party in second place behind Labour, but this was before Mitchell had announced his retirement. Victoria Ayling, a former Conservative, is Ukip’s perhaps controversial choice of candidate. Labour ought to be equally concerned about Ukip’s designs on Great Grimsby. Like Ukip, it has chosen a woman to contest the seat: Melanie Onn. My instinct is she will win, with Ukip sucking away more votes from the Tories than Labour. It will be a scrappy fight, though. No such worries for Labour in Kingston-upon-Hull North, where the nearest challengers will be the Liberal Democrats. It’s their one and only target in the region, but they’ll miss out – as they will across the country. 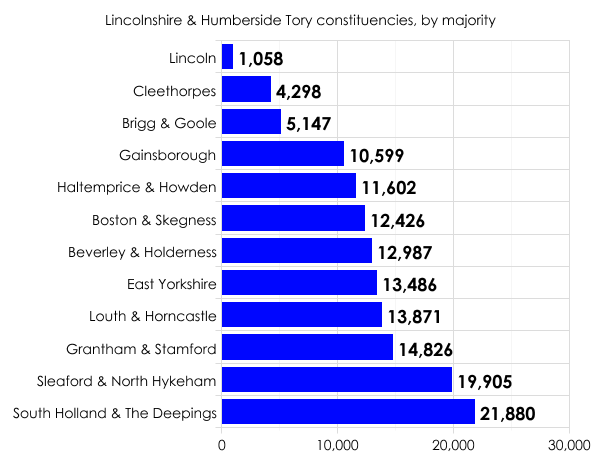 If Labour does lose Great Grimsby, compensation should come in the form of Tory-held Lincoln, a bellwether seat since 1974 that needs only a 1.2% swing to change hands. Lord Ashcroft’s recent opinion poll suggested Labour are well on course to take the seat, but as I said at the time, this is a place where Labour ought to be doing well as a matter of course. Where it needs to do well are in seats like Cleethorpes, its other target for this region, and which would need a 4.8% swing to change hands. Lincolnshire & Humberside might end up being an area, again like East Anglia, where very few gains are made by either side. There aren’t many marginals, only two ultra-marginals, and few realistic targets. It may be that the current totals of 12 Tory seats and five Labour seats alter by only one (Lincoln). I also think this will remain two-party territory, with no space for the Lib Dems – or, for that matter, Ukip. NB: South Holland & The Deepings – possibly the constituency with the most beautiful name in the country.